By Community Chickens on June 18, 2012 Visit Community's Website. We began with a small coop that was very hard to clean. It was short and you could not stand upright in the coop or enclosure. We had seen a coop similar to what we built but it was also too short to stand in. 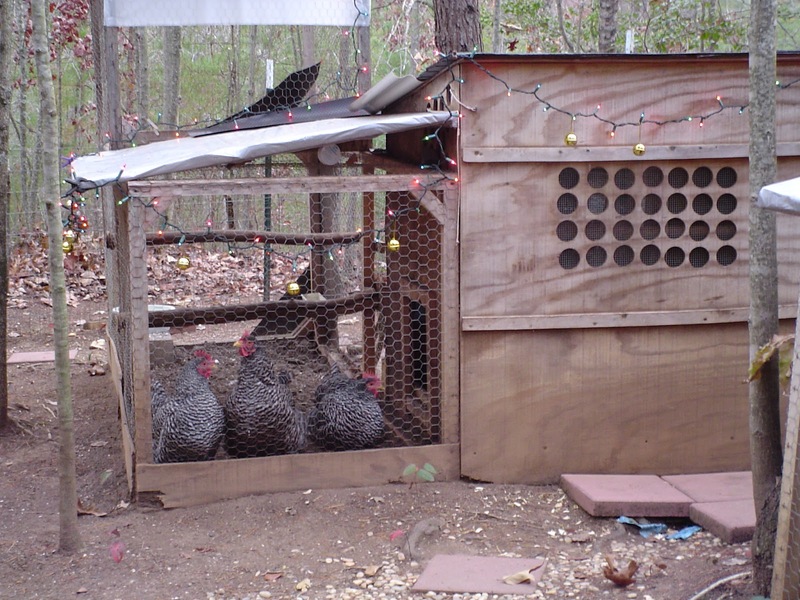 We did a lot of reading on the pros and cons of chicken coops and came up with our own plans. My husband and I decided to take on the project of building our own so we could combine the best ideas into one plan. 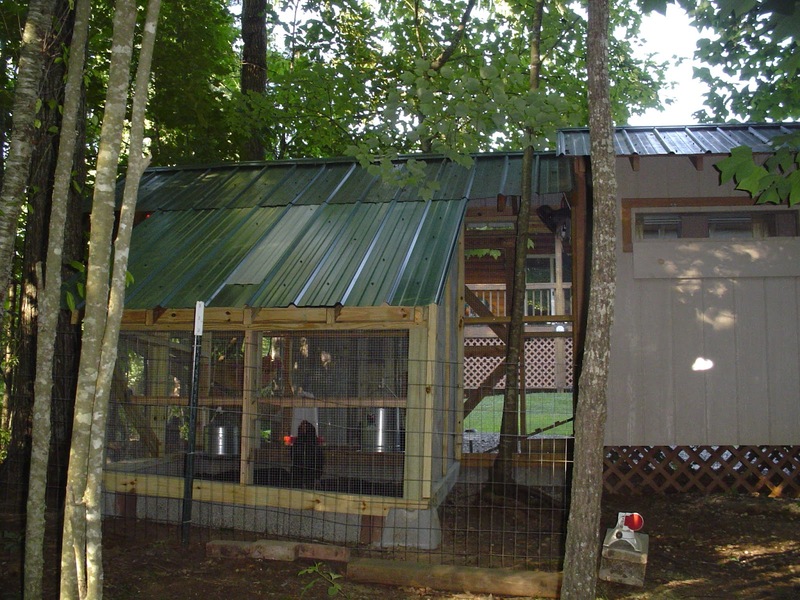 We built the coop from the ground up starting with a raised insulated floor. Raising the floor keeps the wood from rotting out and keeps the coop dry when it rains. We put linoleum on the floor to make it easier to sanitize the coop. curtains but those are more for me than the chickens. The man door on the end makes cleaning access a breeze and the coop is tall enough that my husband who is 6 feet tall can stand inside. The chickens have the small door on the other end that leads into the covered run that has a slide closure so we can keep heat in during the winter. 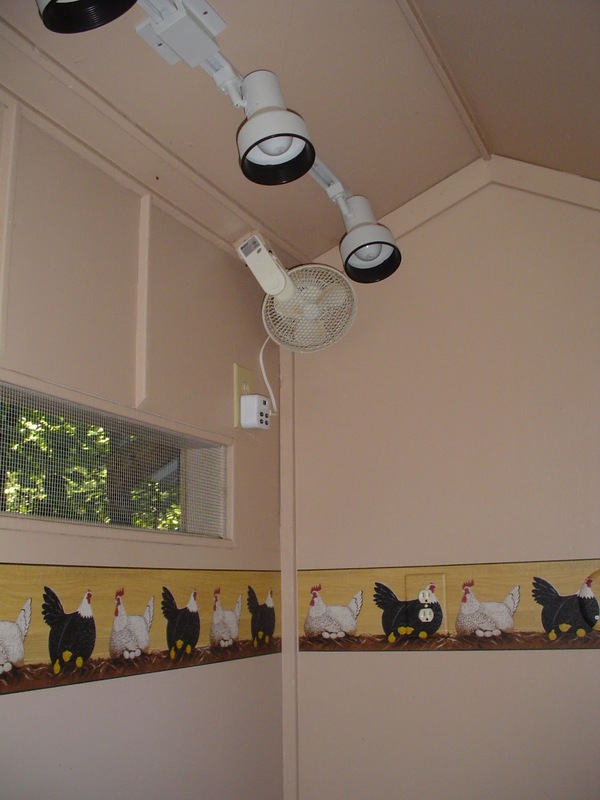 We put small clip on fans in the coop and run areas during the hot days of summer and ceramic heat bulbs in the coop during the winter for the chickens comfort. The fans and heaters are on thermostatically controlled outlets so they only come on when they are needed. We use a heated water dish in the winter to keep water from freezing. Every morning I go out to greet the girls and clean out the nights deposits. Salad tongs make a great poop picker upper. The outside flap over the three nesting boxes makes for easy access for gathering eggs. There is also a sealed compartment under the side flap for storage. All of the roosts slide in and out of joist hangers for easy removal when cleaning. So far the only change we made on the original design was to add additional space to the run. We added onto the original 4×10 run to make an additional 6×6 gymnasium for the girls to play in and give them more room to take their dirt baths. 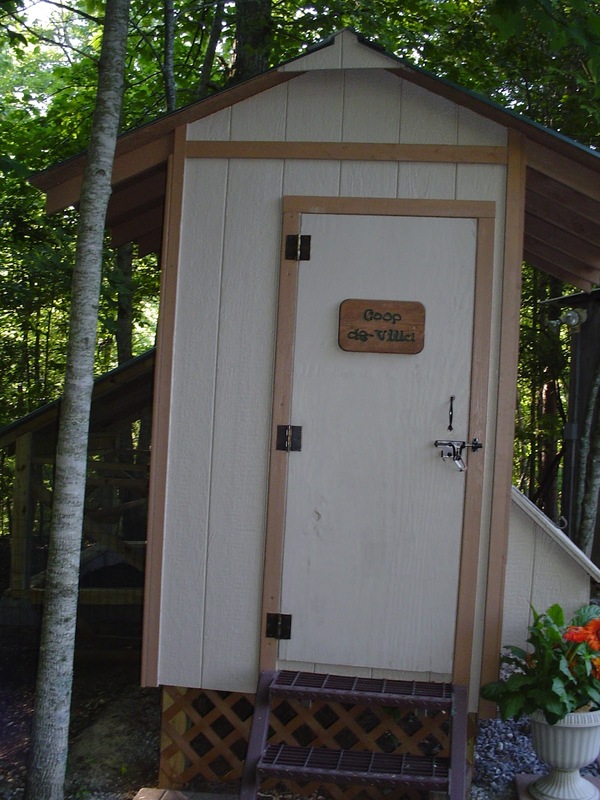 All in all I highly recommend this design for ease of cleaning and comfort for the chickens. We learned a lot about carpentry and had a great time building our project. 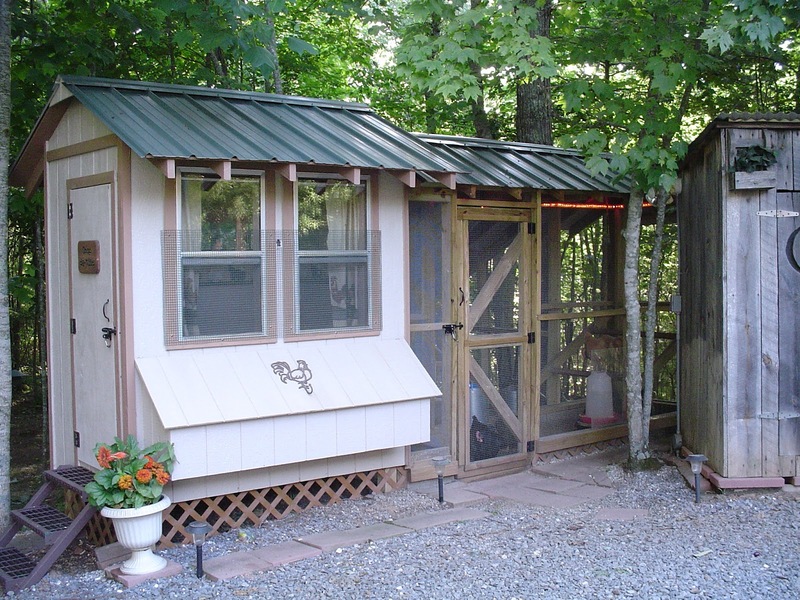 Our neighbors all call our coop the taj mahal of chicken coops. Maybe we went a “little” over the top but our girls are worth it! Cool Coops! – The Cluck Bus! 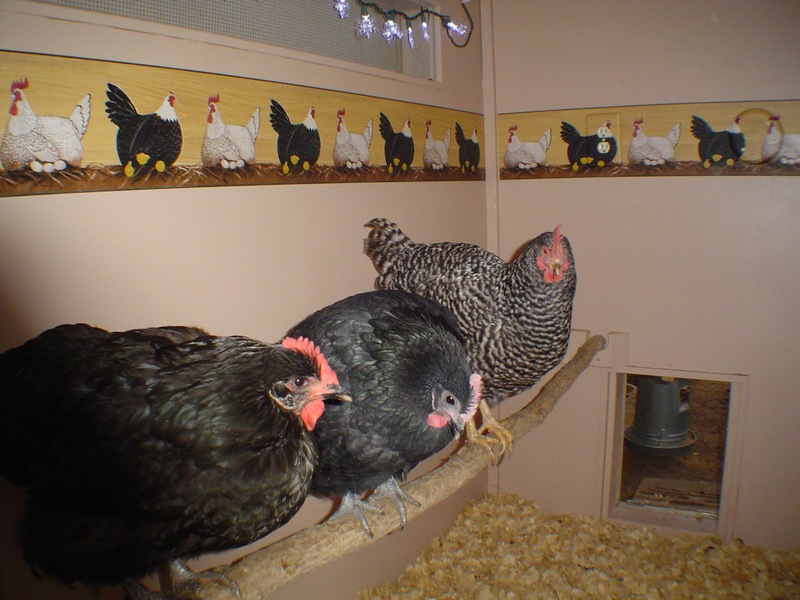 I love that you painted the inside of the coop. I’ve studied hundreds of pictures of coops and they look so cute on the outside then the pictures of the inside look so unfinished. Great job! Wonderful, we’re looking into raising chickens and I love your coop. Hopefully by next year we’ll be ready. Thanks for sharing. Hi, It is a lovely, yet useful, coop and run. I’m getting together info before I start my forey into chickens and have to build a coop yet. How does one attach the outside nest box onto the coop frame? I will be building it, hopefully with some neighbor’s input or labor. I can do ‘squares’, mitering is a bit difficult as I seem to cut it wrong a few times before I get it sort of close right. I like the idea of being able to slide the boxes out for cleaning. If the boxes are of wood, do you paint them? I would think the chickens might nibble at it. Some really good ideas in the pictures … congrats to you both, it is a nice coop. I got the thermostatically controlled outlet at Amazon.com. It is a Lux WIN 100 it is about $35. I love your coop! You guys did a wonderful job! Thanks for sharing! 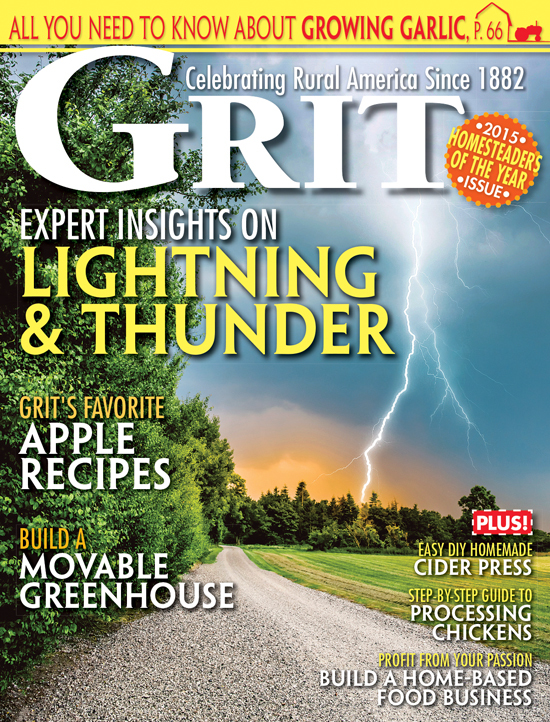 Where did you get thermostatically controlled outlets? I want one! Great ideas! We are just building our coop and we keep seeing all these great ideas for it!